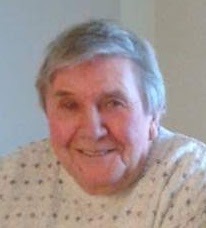 Jack Irvin Estabrooks, 79, of Lakeview Manor and formerly of Hillsborough passed away peacefully on February 3rd, 2019 at the Moncton Hospital with his loving family by his side. Jack was born in Midgic, NB on July 10th, 1939 the son of the late Parker and Selma (Sears) Estabrooks. Jack worked in sales most of his life last working at Hollis Ford Dealership before his retirement. He was a people person and could talk to anybody. He enjoyed playing hockey in his younger years. He spent a lot of time in his vegetable garden and looking after the house in Hillsborough. He enjoyed being outdoors and picking greens was one of his favourite pass times. He also had a special place in his heart for animals especially his little dog, Ceasar. His family was very important to him and he would do anything for them. He was very active in his grandchildren's lives. He loved sharing in all their sporting events and cheering them on and supporting them in all their endeavours, they were definitely his pride and joy. He lived life to the fullest and felt blessed to have the support of his loving wife, Marg, and his girls, who were there for him through his struggles over the past few years. He will be remembered for his great smile and his laugh. "Cherish the good memories." He will be deeply missed by his wife, Margaret (Steeves) Estabrooks of Hillsborough; daughters, Sherry Legere (Paul) of Moncton and Beth Estabrooks (Charles) of Hillsborough; his treasured grandchildren, Chelsea (Yumain), Lindsay (Dave) and Cameron; his precious great grandchildren, Nixen, Mason and Lincoln; sisters, Myrna Bourgeois (Derek) and Sharon Cameron (Ralph) both of Moncton; sister-in-law, Joan Jonah of Bellville, ON. He will also be missed by several nieces and nephews. Besides his parents he was predeceased by his in-laws, Cecil and Louise Steeves and by brother-in-law, Howe Jonah. Honouring the family's wishes there will be no visitation. A Memorial Service and Celebration of his Life will be held at the Hillsborough United Church on Saturday, February 9th, 2019 at 2:00pm with Rev. Peggy Reid officiating. Following the service the family will be meeting with relatives and friends for further sharing of memories and for refreshments in the Church reception area. Interment will be in the Grey's Island Cemetery, Hillsborough, NB in the spring. For those who wish donations to the Alzheimer's Society, Friends of The Moncton Hospital- (Palliative Care) or charity of the donor's choice would be greatly appreciated by the family.